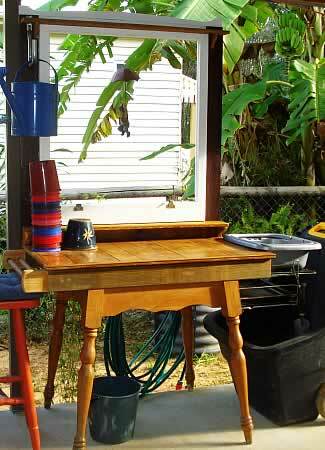 Whimsical potting bench (click to enlarge). My main goals when building this potting bench were to re-use materials wherever possible, and to keep the costs to an absolute minimum. After building a lumber box to tame and sort the timber I had, I was able to determine that I did not have sufficient timber to build a potting bench to the design I had chosen, however the top of an old table which a friend had given me was disintegrating and so was in need of replacement, making it a perfect if somewhat quirky candidate for the base of the potting bench. 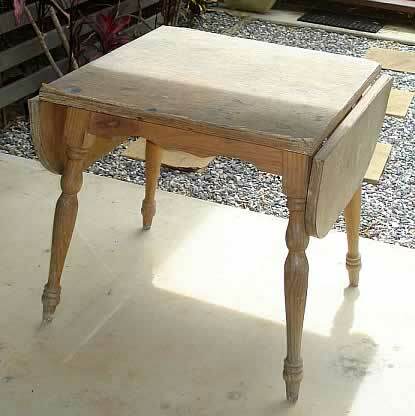 Drop-side table – before re-use for potting bench. As the project evolved, I experimented with different ideas to complement the odd combination of materials. 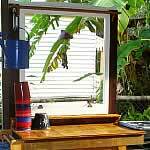 I finished it off with a few playful touches such as a window and planter box, and incorporated a portable sink (which was the only item I purchased for this project). 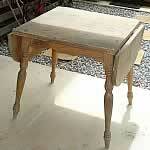 Old table (table top was removed as it was disintegrating) – free, given from friend. Hardwood tongue & groove floor boards – free. Hardwood decking off-cuts – free. Treated pine posts – free. Treated pine slats – free. Old sash window frame – free, from demolition site. Oven racks – free, found in council clean-up. Utility hook – leftover from previous project. 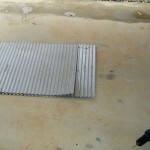 Hose reel – free, re-used. Towel/utensil rail – free, re-used. Completed lumber box (click to enlarge). Recently I have amassed a considerable amount of re-usable timber for my ‘recycle art projects’ and despite my best efforts to keep it sorted, it always seems to find a way of getting out of control and spilling out of its cardboard box. 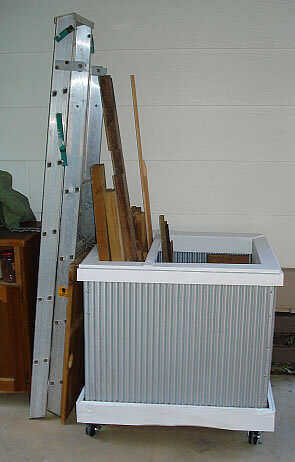 Before moving house late last year I bought several sheets of used mini-orb galvanised iron from Hervey Bay Reuse Market Centre, which I had been planning to use to make a mobile veggie garden box, however my new home already has a veggie garden which I have rejuvenated with my compost etc, so I decided instead, to use the materials to make a mobile lumber box this weekend. Almost no change was needed from the original design or materials (I added removable hardwood timber strips on top and inside the bottom of the box to separate longer timbers and stop them slipping), so if my requirements change later it’s no problem to use it as a veggie garden box. 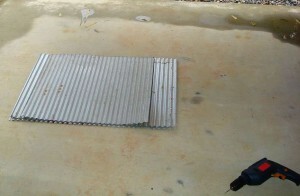 Used mini-orb galvanised iron sheets. 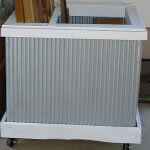 Mini-orb galvanised iron (4 1/2 sheets) – $7 from reuse centre. Wood stain – leftover from previous project. PVA glue – I keep a stock of this for projects.